The Rebel Sweetheart. : Spotlight | The Eternity Rose. Spotlight | The Eternity Rose. Valentine's has long been over, and by now, the flowers that were given as gifts to celebrate the occasion have either wilted or have been thrown away. After all, fresh cut flowers look good for just three to four days - a week, at the most. Mine neither dries, fades, or wilts, and will last and look the same for many more Valentine's (and even wedding anniversaries) to come. 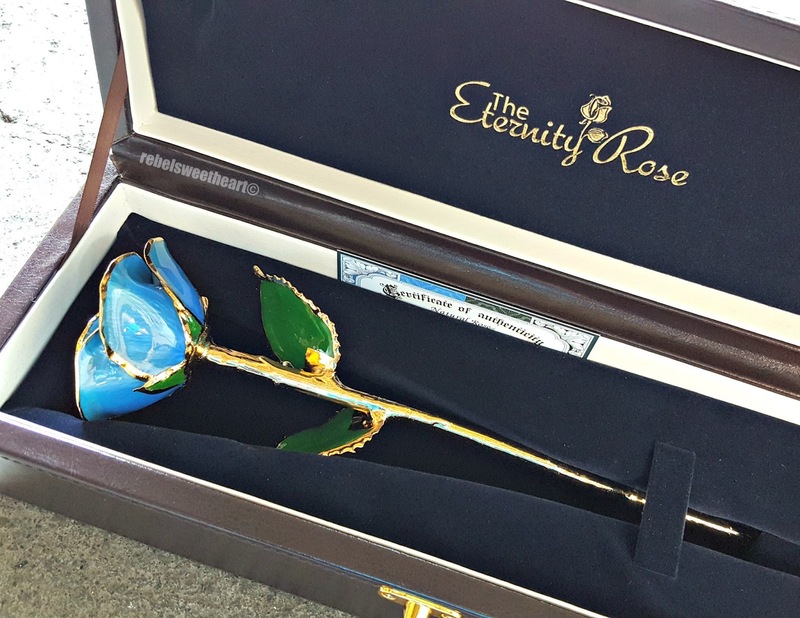 It's called The Eternity Rose, a one-of-a-kind gift that's guaranteed to live up to its name. 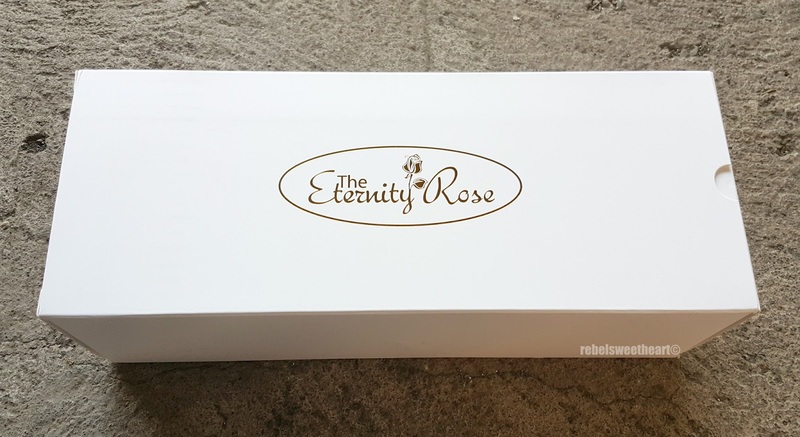 Created by a group of Australia-based artisans, The Eternity Rose has been in the market - Europe, in particular - for over nine years. A rose for all eternity. 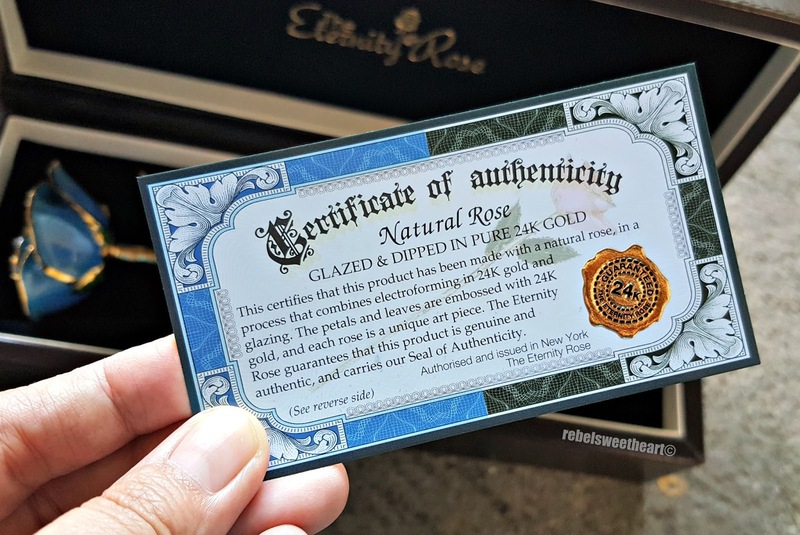 What makes this product extraordinary is that it's made with a real rose, grown to perfection by a team of trained horticulturalists who vigilantly watch over the blossoms and harvest them at their ideal stage of bloom. The roses then undergo a complex, 60-step process of preservation which includes 'freezing' the flower in its natural form, coating it with several layers of lacquer, dipping it in platinum, silver, and gold, or glazing and trimming the edges with pure, 24-karat gold. The entire process takes about 90 days, making this product a finely crafted work of art. Even the leather case is a work of art. My very own Eternity Rose is an exquisite, light blue rose, glazed and trimmed in 24-karat gold. Sure, a gold or platinum-dipped rose would look even more majestic, but I personally chose blue since this color represents the 10th wedding anniversary. 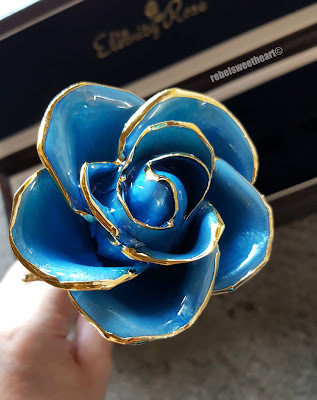 Husband and I are celebrating our tenth year of marriage this June, and the Blue Eternity Rose makes a perfect, lasting keepsake for this happy occasion. Makes a lovely conversation piece, too. The glazed roses are also available in other colors, including red - the ultimate symbol of beauty and love. Each rose is presented in a stylish display case made from leather, and comes with a Certificate of Authenticity. 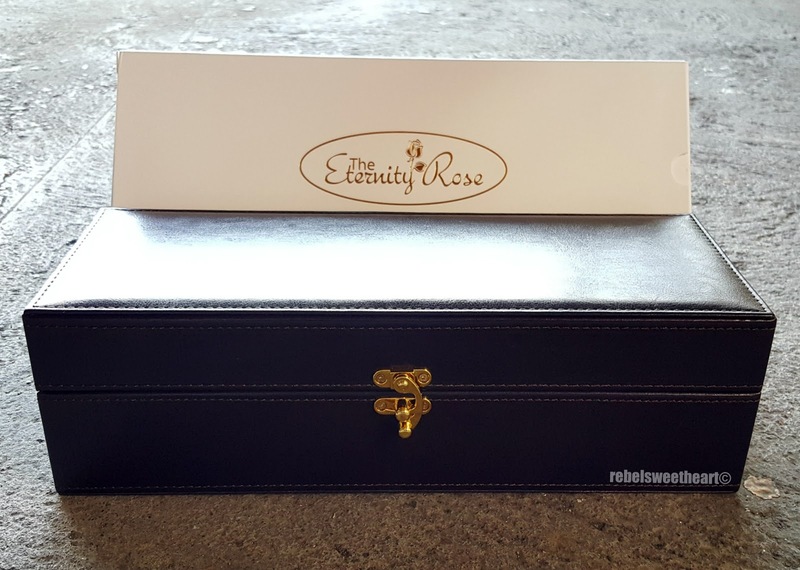 Aside from Valentine's Day and wedding anniversaries, The Eternity Rose makes an exceptional gift for just about any occasion - birthdays, Mother's Day, and even graduations. 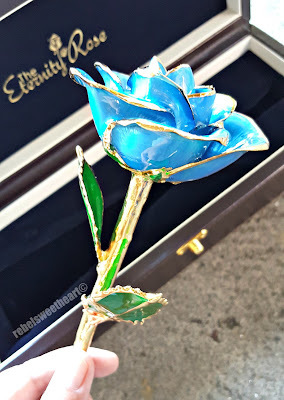 They can be purchased directly from The Eternity Rose website, and can be bought with or without a display case, or as a set with a brass vase also dipped in precious metals. 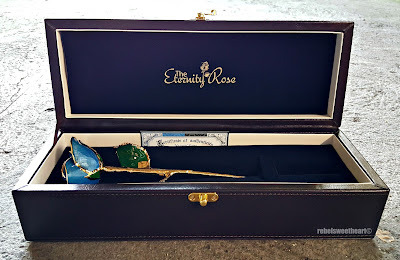 A closer look at my Light Blue Eternity Rose. If you prefer something wearable, you'd be glad to know that The Eternity Rose also has rose pendants and earrings available. You can buy them as a set to match your Eternity Rose, or purchase them separately. They offer free shipping for all orders, and can deliver to over 50 countries around the globe, including the Philippines. Visit The Eternity Rose website to know more about their products and view the complete collection and/or follow their official Facebook page for promos and product updates. I've never heard of anything like this before! What a wonderful gift to show ever-lasting love! How neat is that... what a great momentum and so interesting that there is a real rose in there. 90 days seems like such a long time line what an amazing amount of work to go into it! 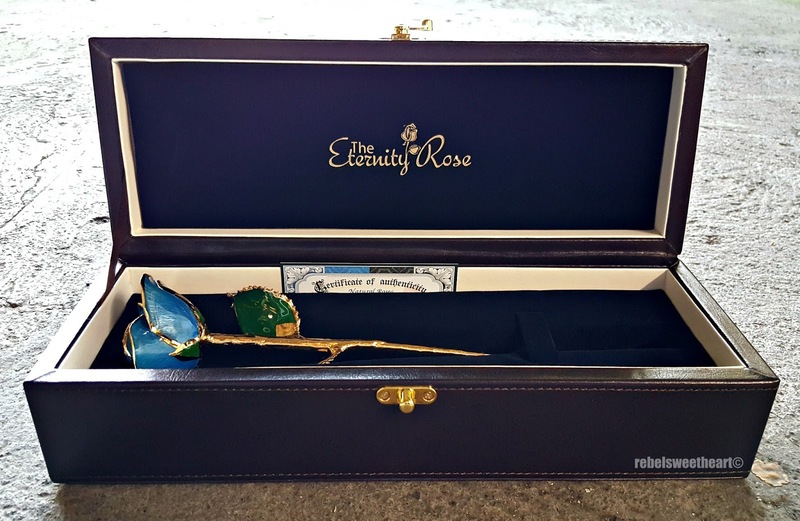 The Eternity Rose is beyond beautiful, I would love to add one to my personal collection. I will be dropping hints to my husband, we have an anniversary coming up soon! That is really pretty. I would prefer to get a flower like this than a real one. They last longer and less up up keep. Ohh I love this! What a unique gift. I will consider buying this instead of "fresh" roses in the future. This is such a loving and thoughtful gift to give to someone you love. It really is beautiful. Wow what a pretty flower. Never heard of this, but love the idea. These are beautiful and what a lasting gesture! Thanks for sharing! That is absolutely beautiful. I hope you cherish it. I love blue too. I would love the earrings in aquamarine or deep blue. My husband's birthday is in March and that's his birth stone color. Plus, he was in the Navy, so the color of the sea reminds me of him. That's so cool that it is made from a real flower. It's a great metaphor for love that occurs naturally and lasts forever! The fact that this has been vigilantly prepared and watch over by experts makes it an automatic treasure for a lifetime. This is the coolest thing I've seen this month! These are beautiful! I have a friend who receives one every year during her anniversary. They're a lot more stunning in person. This is such a beautiful way to signify an anniversary. I've never heard of this but I love keepsakes. Wow this is amazing. I can't believe they make it from a real rose too. Roses are probably my favorite flowers and these are stunning. Good Movies To Watch With Your Kids. 5 Ways Good Hair Can Improve Your Life. 7 Ways to Prevent Unwanted Blemishes. Spotlight | Sleek Makeup Eye & Cheek Palette.